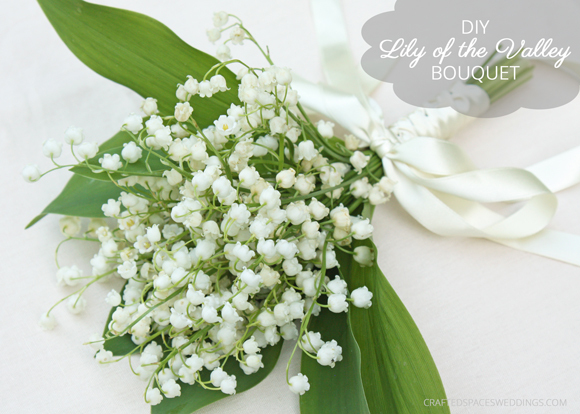 Lily of the Valley is also known as "Our Lad's tears," "May lily" and by several other names. 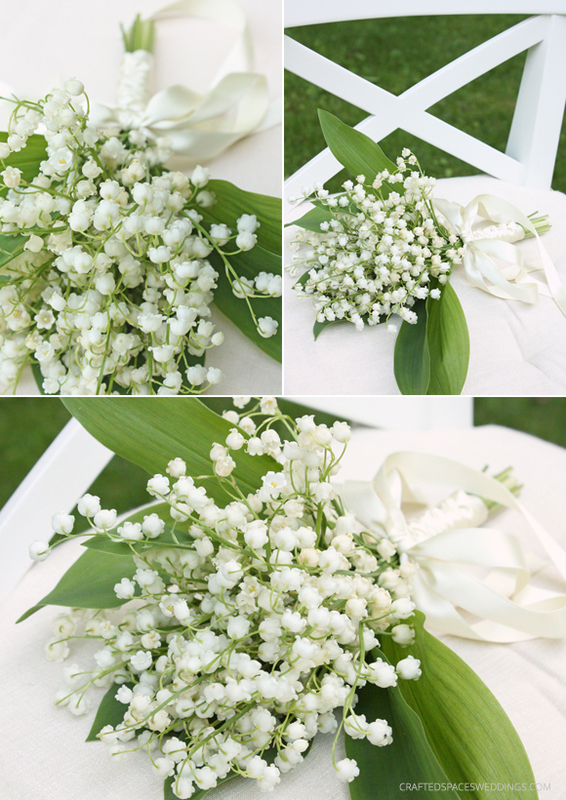 The Lily of the Valley has broad, spear-like foliage and fragrant little white bell-shaped flowers. 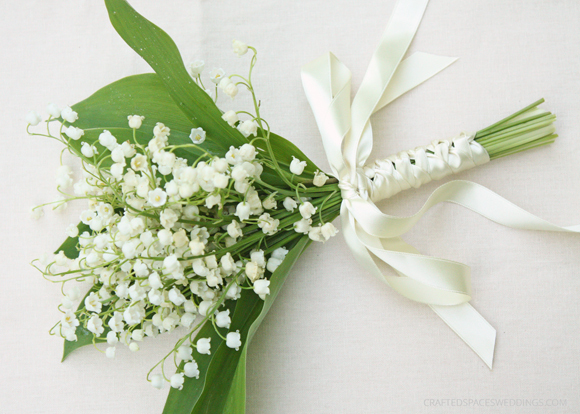 While it’s a popular garden perennial, the Lily of the Valley has seen increasing popularity as a cut flower, especially in wedding bouquets. They are in season from April to July depending on where you live. In Ontario they start to fade by the end of May. However, they are available to purchase throughout the year. They have been very popular since Victorian days, and are a symbol of love and peace. The Lily of the Valley has much significance in mythology, legends and religious beliefs. It is a popular flower for weddings and may be considered by some to be an expensive choice of flowers to use throughout your wedding decor. They have been featured in royal bridal bouquets at the wedding of Grace Kelley and at the wedding of Prince William and Catherine Middleton. They have also been a national flower and an official flower of various countries and organizations. Like many other flowers and plants, they are also considered highly poisonous and should not be eaten. These delicate looking flowers are stunning all on their own or as an accent flower throughout a bouquet of other flowers. They have a beautiful scent and can also be used in other wedding arrangements. 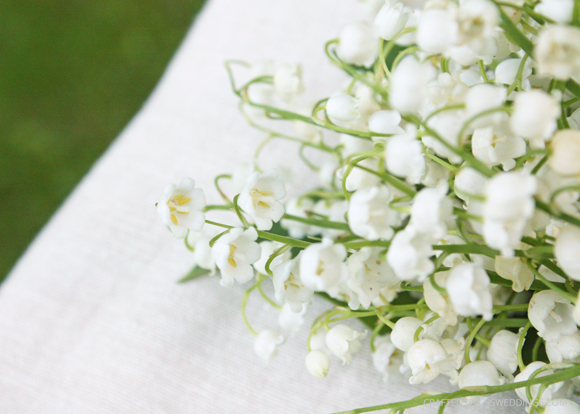 I have put together a small bouquet with Lily of the Valley flowers from my garden. A bouquet like the one I made is great as a small bouquet; however, if you will like a fuller more robust bouquet I suggest using more stems or adding other flowers to the bouquet. 1. Start by collecting the stems in your hand and follow by adding the greenery (I used eight leaves) around the outside of the flowers. Arrange the flowers in your hand to suite your own liking. 2. Use the elastic band to secure the arrangement and cut the ends of the stems in a straight line, leaving approx. 3 inches past the length of your handgrip. 3. 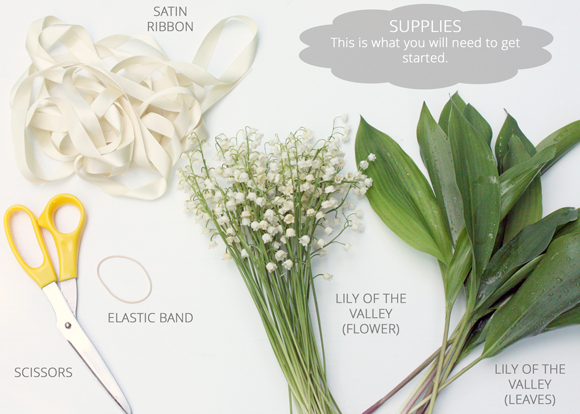 Cut a 42" (106.7 cm) length of satin ribbon and wrap it around the stems, starting at the bottom and working your way upward to the base of the flowers. Tie the ribbon in a knot at the base of the flowers and cut the ends at an angle. 4. 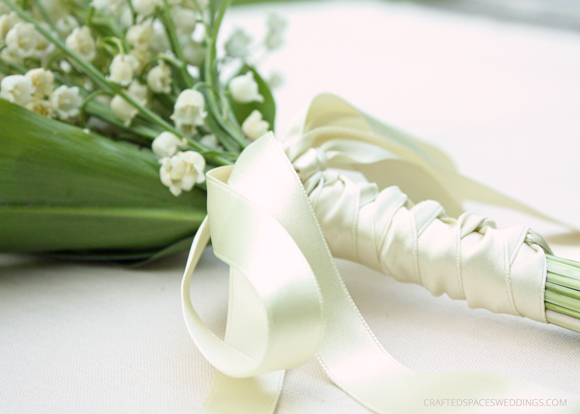 Tie the remaining length of satin ribbon in a bow at the base of the flowers and cut the ends at an angle. You may come across suggestions that you need to wire the stems, which is a process in which each flower is stabilized with a thin florist wire so that they do not droop. This process makes for a more structured bouquet. If this is what you have in mind I suggest you visit your local florist and discuss the bouquet you will like. *Remember to keep your bouquet watered by placing it in just enough water to cover the stems, without wetting your ribbon. What a beautiful blog post. Great photography! Keep up the wonderful work that you are producing. Thank you! I am looking forward to adding more to the site.